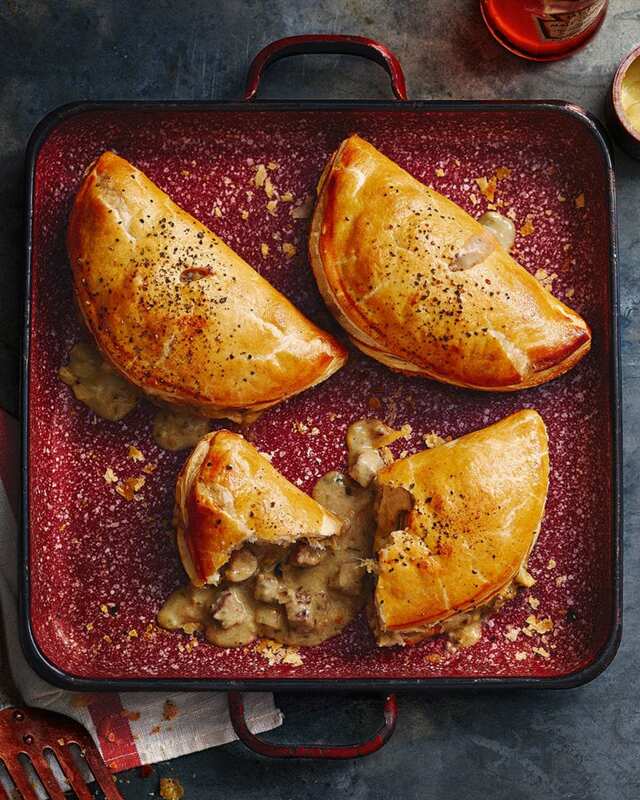 Treat the family to these indulgent puff pastry turnovers filled with steak, mushrooms and a rich cheese sauce. They require a few stages of cooking but aren’t difficult to make – plus the results are utterly worth it. Start by making a white sauce. Put the 30g butter, flour and milk in a small pan, then bring to a simmer, whisking to melt the butter and incorporate the flour. Turn up the heat to medium-high and simmer briskly, stirring, until the sauce has thickened and there’s no floury taste to it. Season well, stir in the cheese, mustard and chopped tarragon, then set aside. In a separate frying pan, heat a splash of olive oil, then gently cook the onion and celery until softening. Add the mushrooms and a knob of butter and continue to fry until golden brown and the vegetables have softened. Scrape onto a plate, then set aside to cool. Wipe out the frying pan with kitchen paper, then brush the steak with a little olive oil. Season with salt and plenty of black pepper, then fry the steak in the hot pan for 3-4 minutes on each side. Set aside on a plate to rest. Meanwhile, prepare the pastry. Roll out the pastry on a floured surface to roughly the thickness of a £1 coin, then use the side plate as a guide to cut out 4 x 18cm rounds, re-rolling the trimmings carefully if you need to (see tip). Brush the edges of each round with beaten egg. Slice the steak into bite-size pieces, then stir it into the cheese sauce with the cooled vegetables. Divide the steak/sauce mixture equally among each pastry round, spooning it onto one half of the pastry only and leaving a border. Fold over the uncovered pastry half and press down on the edges to seal. Brush the turnover with the remaining egg yolk, then chill for at least 30 minutes (see Make Ahead). Heat the oven to 200°C/180°C fan/gas 6. Bake the turnovers for 35-40 minutes until the pastry has puffed up and is a rich golden brown – the filling will start to ooze out of the sealed edges of pastry, which is a good thing. Serve with salad. When re-rolling puff pastry (step 4), to retain the layers, put the pastry pieces on top of each other over the pastry, keeping them flat – don’t squeeze it into a ball as it will destroy the layers and stop it puffing up during baking. Freeze the chilled turnovers on a baking tray, then transfer to an airtight container for up to 1 month. Bake from frozen for an extra 15 minutes or until the filling is piping hot and the pastry has puffed up. Reheat leftovers until piping hot throughout.